With contributions from experts in all facets of biosecurity, this book explains the fundamental elements of biosecurity as well as the related concepts of biosafety and biosurety, detailing how all three concepts fit within the framework of biodefense. Readers are then given the tools needed to assess and prevent biosecurity threats and vulnerabilities. The book explores the nature of biosecurity threats to research laboratories as well as to agriculture, food, and mass transit. Moreover, readers will learn how to apply principles of biosecurity to assess epidemics and protect public health. Biosecurity takes a detailed look at today's biosecurity policy, explaining how it is likely to evolve given current and potential threats to national security. The authors stress the importance of education and advocacy, helping readers develop effective programs to build public awareness and preparedness. The book also presents a novel tool to assess the effectiveness of laboratory biosafety and biosecurity programs. This book will instill a deep understanding of what biosecurity is and what it is not. 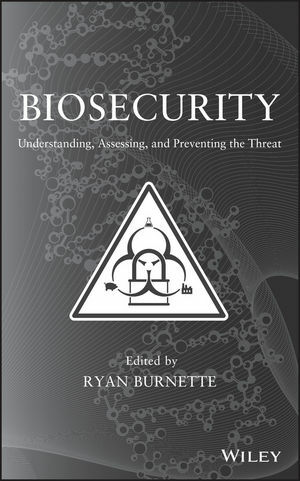 It urges readers to think about the importance of biosecurity as it relates to national security, safety, and health. By exposing major flaws in global biosecurity thinking, Biosecurity sets forth a clear pathway to correct those errors and build stronger biosecurity programs. RYAN BURNETTE, PhD, is Director of Alliance Biosciences, a consulting firm with expertise in laboratory design, operational management, and biorisk management. He lectures and conducts training on biorisk management, biosafety, and biosecurity in the United States and around the world. Dr. Burnette has held positions at Virginia Tech and Vanderbilt University School of Medicine.